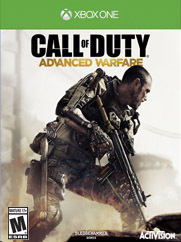 Game Description: Call of Duty: Advanced Warfare envisions the powerful battlegrounds of the future, where both technology and tactic have evolved to usher in a new era of combat for the franchise. Delivering a stunning performance, Academy Award winning actor Kevin Spacey stars as Jonathan Irons -- one of the most powerful men in the world -- shaping this chilling vision of the future of war. The game takes place in a plausible future in which technological progress and today's military practices have converged with powerful consequences. • In this carefully researched and crafted vision of the future, Private Military Corporations (PMCs) have become the dominant armed forces for countless nations outsourcing their military needs, redrawing borders and rewriting the rules of war. And Jonathan Irons, the founder and president of the world's largest PMC, Atlas Corporation, is at the center of it all. Suit up for combat in exoskeletons that evolve every aspect of a soldier's battle readiness, enabling combatants to deploy with an advanced lethality and eliminating the need for specialization. Players experience enhanced player movement and verticality through boost jumps and grappling, covert cloaking abilities, and biomechanics that provide unparalleled strength, awareness, endurance, and speed. With the advent of the exoskeleton and newly advanced armor and weaponry, every soldier commands tactical freedom in any terrain unlike ever before, fundamentally changing the way gamers play Call of Duty across all modes.